Lire Devon is a clairvoyant, able to see the thoughts and memories of anyone she comes into skin-to-skin contact with. She is ostracized by peers for this ability, and her own family had broken apart because of it. Coventry Academy is a refuge of sorts, even so, because she loves learning about magic and the different abilities that others have. This year is even better because she actually made two friends, the werewolf Cal and the occultum (invisible man) Zach. 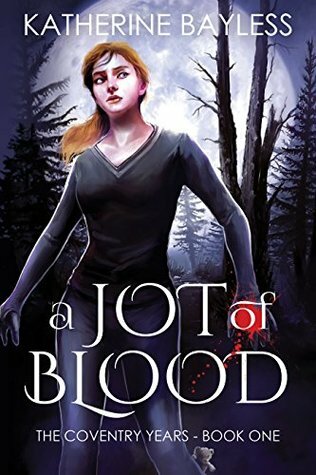 Jot of Blood is book one of the Coventry Years, and is apparently a prequel to another series. I hadn't read that, so I didn't have any preconceptions or expectations about the characters. There are rivalries between students and Lire's insecurities, all of which are real but have that supernatural edge to it. Lire is a wonderful character to read about, and the consequences of being a clairvoyant are vividly outlined. At the same time, she has such hope in the midst of her anxiety and pessimism, and she does have a good sense of humor. The bullying and stereotypes in the novel reflect what many teens go through, but with a supernatural twist. There are lighthearted times in the novel, even with the very serious themes involved. Zach is definitely comic relief, but there is depth there as well. Lire is such a fun character to read about, and the magic discussed in the book is vividly described. I hope to read the other books in this series and look for the parent series this came from.